I am competitive and driven to a fault, but to anyone that knows me, this is no surprise. I can already feel my competitive instinct rearing its head when I think about spinal fusion recovery. Competitive recovery should be a sport! I think my spine surgeon can sense my drive too. During one of my earlier appointments I was drilling him on all aspects of surgery recovery. Me: “So, when can I start driving again after surgery?” Him: “For most people, it’s 4 weeks. That’s usually when you are able to stop taking prescription pain medications. For you though, you’ll probably be ready at 3.” Challenge accepted!! Trainer bike is nearly ready to go! If I don’t have enough spine mobility to actually get ON this bike after surgery, I already have a low step-thru frame picked out. Cushy seat, upright bars, AND my normal trainer tire will fit perfectly. I’m ready, so bring it. At spine surgery class, the nurse told us about our mobility restrictions (which I plan to follow to ensure a successful fusion, trust me), but she also said that patients who are in good physical shape are able to do more things sooner. More flexible patients can put on their own socks and shoes soon after surgery instead of needing someone to dress them for a few weeks. Those who can do squats and keep their spine straight can reach things lower than waist height around the house. Also, people with a higher pain tolerance generally do better with their requirement to keep the body moving at regular intervals after surgery. After being basically cut in half it will hurt like hell to roll over, change positions, sit up, and especially walk, but the more I do this the lower my risk of blood clots will be and the more successful fusion I’ll have overall. At class, she also stressed the importance of building muscle before surgery — lying in bed now and doing ankle circles, flexing the quads, glutes, and abdominals so we’ll be better able to walk after surgery. I beamed, knowing I’ve been using electric muscle stimulation (EMS) to give my larger muscle groups a workout a few days a week while I’m mostly recliner-bound. See looping shot above of what my quad looks like when the current kicks in!! 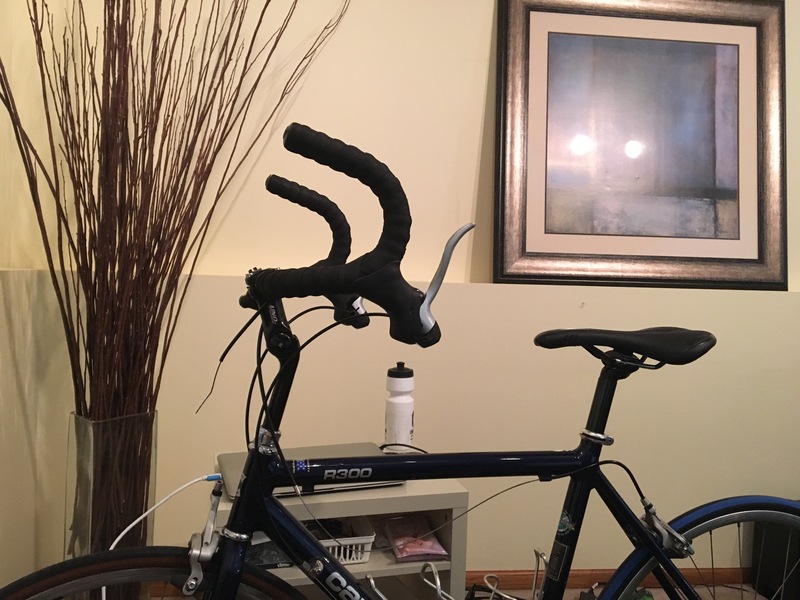 … one of my most important goals pre-surgery is to get a franken-trainer-bike set up downstairs with high handlebars, a step-stool to help me get on it, and a comfy saddle. I’m dead serious about getting this bike dialed and ready to roll whenever I am. Stem’s here, 650C trainer tire is here, and I’ll be riding my beloved Kurt Kinetic Smart Control trainer with Zwift. The other key focus of my competitive recovery goal is when I can ride the bike trainer again. I asked my surgeon and he said that I COULD ride at 3 weeks and it wouldn’t do any damage, but he’s pretty sure I won’t want to due to pain. I asked if I had to keep a straight spine or if I could hinge at the hips, and he said that from a medical standpoint hinging at the hips (think moderately low touring position or MTB position) was just fine as far as he was concerned, but it’ll hurt like hell. Based on this conversation, one of my most important goals pre-surgery is to get a franken-trainer-bike set up downstairs with high handlebars, a step-stool to help me get on it, and a comfy saddle. I had been bugging my boyfriend to get me a quill stem ordered from Q ASAP, and that’s when he realized I was dead serious about getting this bike dialed and ready to roll whenever I am. Stem’s here, 650C trainer tire is here, and I’ll be riding my beloved Kurt Kinetic Smart Control trainer with Zwift. The Zwift-a-torium is almost set up and ready to go! The only thing left to evaluate is if I want the handlebars flipped upside down / towards me to make the reach even less. I hope to be able to push my physical limits and start pedaling again soon. I can feel my fitness waning and the sooner I get back on it the less I’ll atrophy. There’s only so much ESTIM a person can do to try and keep their muscles around. I’ve been posting more regular updates about me on this Facebook page I created that goes along with the blog. Sometimes it’s nice to be able to hop online, craft a few sentences, and run. I anticipate I won’t have a ton of energy to blog after surgery so please go follow me there!